Did it not occur to you that the boys that left UNC to fight in the war fought on both sides? Silent Sam is silent because he has no ammunition. Silent Sam lost, but he didn’t lose his life. Silent Sam is a monument to racist pride and to the students who fought and lost the war, not the students who fought and won. The students who won that war caused it so that you’re now arguing with me, a white woman married to a white man who has Peruvian latte colored children his mother considers “black”. Ronnie is my brother-in-law, and I believe he loves all his nieces and nephews, and I believe like I love my brother-in-law, I bet he loves his brother-in-law too. This is all possible because of the students of the University of North Carolina that went to war and won. Maybe if they had gone out to fight and die for their brother’s freedom, instead of a place to be racist and keep slaves…? You act like history is the monument. No history is what happened. A monument is to help you have pride in remembering it. The sons of the nation’s first public university who fought on the beliefs of Christ, and will be judged so. Christ will remind you that you did it to the “least” of his brothers you did it to him. So to get it right, history is what happened… not a monument so you can try to remember what happened on one side. The monument isn’t history, history is history. Putting the monument up with it’s dedication speech is history, as is tearing it down. It seems you think that the monument is history. Try this one: you can’t change history, right? Changing the monument, tearing it down, won’t change history either. You can keep your history. We have your monumental reminder of failure. have the Jews tore down the concentration camps? Can you imagine being tarred and feathered in Charlotte’s town square and not having anything to show your children to prove the atrocity? Can you imagine going to Germany to tour these memorials? They are for remembrance. Compare what they choose to remember to what you’re clinging to. And who is in control of that rememberance? You don’t have the losers setup the monument. Mourners setup remembrances, and winners are honored by those who fought for and loved them. Your Southern pride made you fight against Jesus’ brothers… I mean I assume you’d fight with the South if it’d rise again, or if you could have then? Have the American Indians had their say in all the injustice that has come to them???…. How many marginalized and exploited groups should we wait to get justice before the justice can start? You have to start somewhere, right? What injustice came to American Indians? Trump poking fun at Pocahontas? What else? I will give you that not all history was positive, but needless to say ITS STILL HISTORY!!! Yes, it is HISTORY. We just discussed that. UNC sent 1,000 students to war. They were brothers at school, at war against each other. The school erected a monument to the losers. The Descendants of the winners, those who fought for and won freedom for slaves, tore it down. All of those events, are history, including Julian Carr’s speech which made the error all that much more egregious. UNC is known for sparking the 1 in 5 girls who become women at university are also raped before they graduate… the least they can do is fix the easy stuff, like putting up a monument for the students who fought and won freedom for her students. Do we need to put up a monument for other loses? Do you have any wins you want to celebrate? Anything good to remember? Shall we go to Gettysburg and tear down all statues and remove all head stones ????? You believe in Jesus right? Abe Lincoln, who gave the Gettysburg address, is on my family tree. 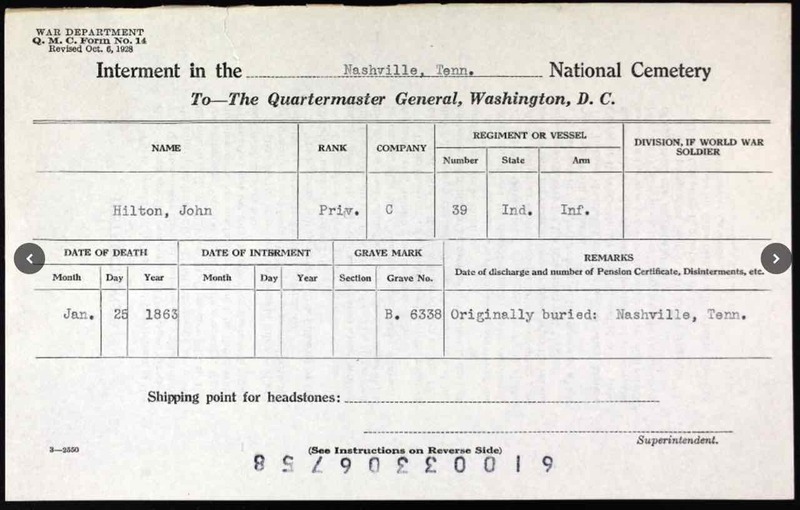 My great uncle John A. Hilton died at Stones River, known as one of the bloodiest wars of the Civil War. He volunteered. Abe led, and John fought for, like many more of my family from Indiana, our black brothers and sisters in the South who you still subject to slavery. We won, and my family moved South. Just like how when we were known as Scots we moved to Ireland, the Ulster plantation. So, go kick my uncle’s grave stone— now, be careful, that’s Jackson David’s great uncle too. He might not take kindly for your kicking his heritage. My his daddy would prefer you leave it intact at least until the kid gets to go visit it first? Well, they moved uncle John from where he was first buried to the National Cemetery. 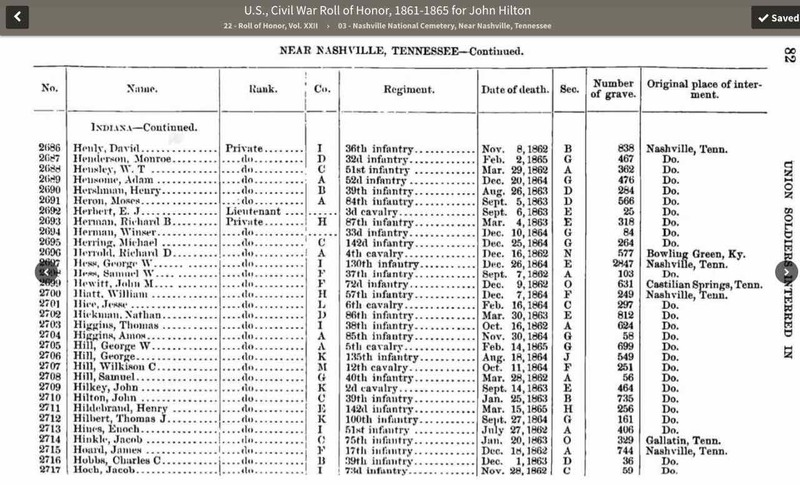 Here’s the Civil War Roll of Honor, and his grave number. Enlisted in Company C, Indiana 8th Cavalry Regiment on 29 Aug 1861. Mustered out on 25 Jan 1863. Well, I think that’s where it stops. I’m pretty sure you won’t survive your attempts to do what you have suggested above. Don’t forget, these people didn’t die fighting and losing… they died winning. God’s son will say to them, you did well, you fought for your brother, and you did not fear losing your life so that he should have his. Well done, son, well done. “ oh I’m offended by this and that, it’s got to go”…. that is how you yuppies think…. Oh yeah, what makes me a yuppie? That I prefer honoring my family who died for the right side of history rather than waste my time arguing with the loser and their descendants still carrying the same flag and burning crosses out back? that statue has stood there way before you or I …. if it was so offensive then why hasn’t it come down before now??? It’s not offense to anyone but you radicals . Because the South has been dominated by the ones who lost the war for all these years more. You’re correct, you don’t find it offensive, and in Star Wars, you’re also not on the right side of history, if you know what I mean. Otherwise, just assume it has to do with Jackson David’s family and my dead daddy. 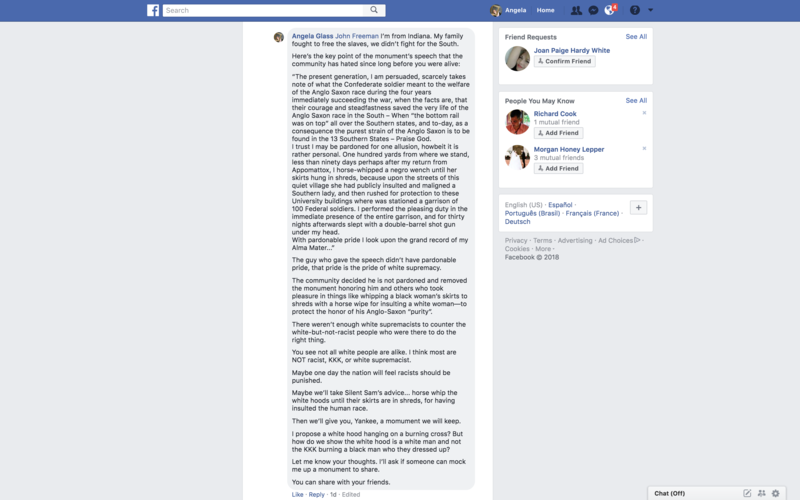 And it’s a prime place to either pick on me like a bully, or be kind and get to know an orphan of the family you’re connected to on Facebook. I’m more accurately known, temporarily, as a “Valley girl”. I live in the “Valley” that that term was coined for, literally. It’s no Love Valley. 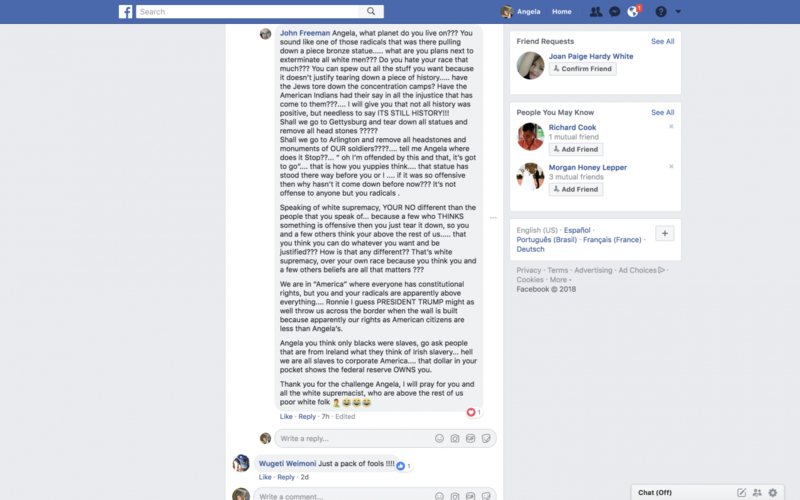 Speaking of white supremacy, YOUR NO different than the people that you speak of… because a few who THINKS something is offensive then you just tear it down, so you and a few others think your above the rest of us….. that you think you can do whatever you want and be justified??? How is that any different?? That’s white supremacy, over your own race because you think you and a few others beliefs are all that matters ??? Okay, if you picture an Asian, a Hawaiian, a Peruvian, a Mexican, a Canadian, an Australian, an America, an African, and an Eskimo… they don’t all have separate beliefs where we will stand rank them by who is superior — right versus wrong. No, this is about wrong and right. The Civil War was about God’s sons fighting either for or against keeping black men, women, and children as slaves. I feel like that’s an oversimplification because I want to rage about the experience of the life of one of the slaves of the Southern United States… it was about the human experience of our black brothers at the hands men who still forget we were all created equal. It’s not one person’s — whether based on race or not — viewpoint versus another’s, this is about RIGHT versus WRONG. It’s also about you literally lost the war. It’s a public university, the nation’s first. It belongs to the country, to the state, to the people who fought and won. This isn’t a “few others” beliefs. You’re not the majority. You’re the minority. It’s your beliefs which are dying out, because you have to hide what you think under a white hood, and in your backyard, because 45 out’ed what I knew all along. Yeah, you know America is coming for your way. We are in “America” where everyone has constitutional rights, but you and your radicals are apparently above everything…. Ronnie I guess PRESIDENT TRUMP might as well throw us across the border when the wall is built because apparently our rights as American citizens are less than Angela’s. What constitutional right do you have that has been violated? Are you and Ronnie going to go build the wall? Are you in construction like him? I personally think it’d be nice if there could be two worlds. One for God’s people, the kind and meek, and another where bad people go. I guess that’s what your President is working on? 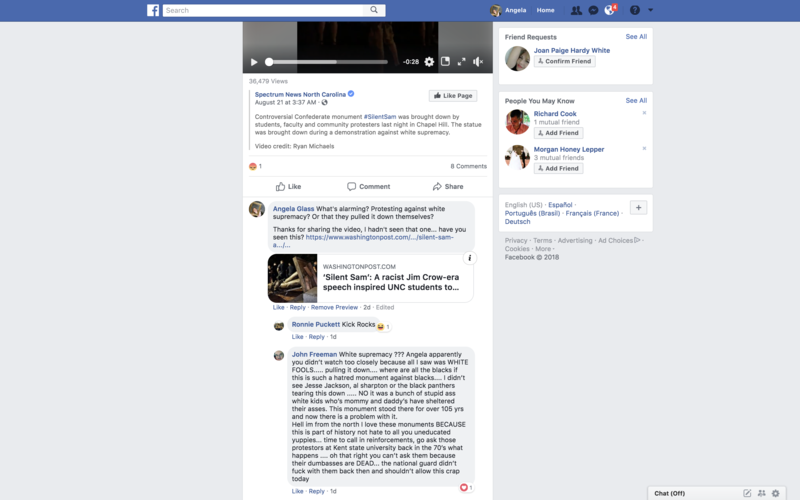 Angela you think only blacks were slaves, go ask people that are from Ireland what they think of Irish slavery… hell we are all slaves to corporate America…. that dollar in your pocket shows the federal reserve OWNS you. You walked right into that one. Ulster plantation, and planted from Indiana to North Carolina for the same service. It’s in the genes. Oh, okay you’re a corporate American slave. We’ll reassign you to a more literal interpretation soon. Imagine if I couldn’t save you from what fears you. Wouldn’t it be fair if you thought being in corporate America was the same as being a slave that some reality TV show would have you do it for real to show you how ignorant you are? I bet a slave descendant would actually volunteer to ‘compete’ against you to show how incapable you are. You found that a challenge? Oh, okay. Well, did you feel this a failure, or do you think you “won” this challenge? You don’t need to pray for me, God doesn’t answer prayers of one not acting in accord with his will. You’re praying for white supremacist and you think they are “above the rest of us” — regardless of how you follow that … I’m sorry if you’re “poor white folk” but even if you think you are, no one is beneath nor above you. At least not until Christ comes. And Christ said he’s taking people of all nations, tribes, peoples and tongues. Did you note how he left color out of it? All he cares about is whether or not you’re worthy. And trust me, your white robes aren’t the white robes spoken of in Revelation. I think you offend Christ. But he can speak for himself, it’s not for me to judge, unless I should be called to such a role and given the authority. → Any Laws Governing the Male Body?